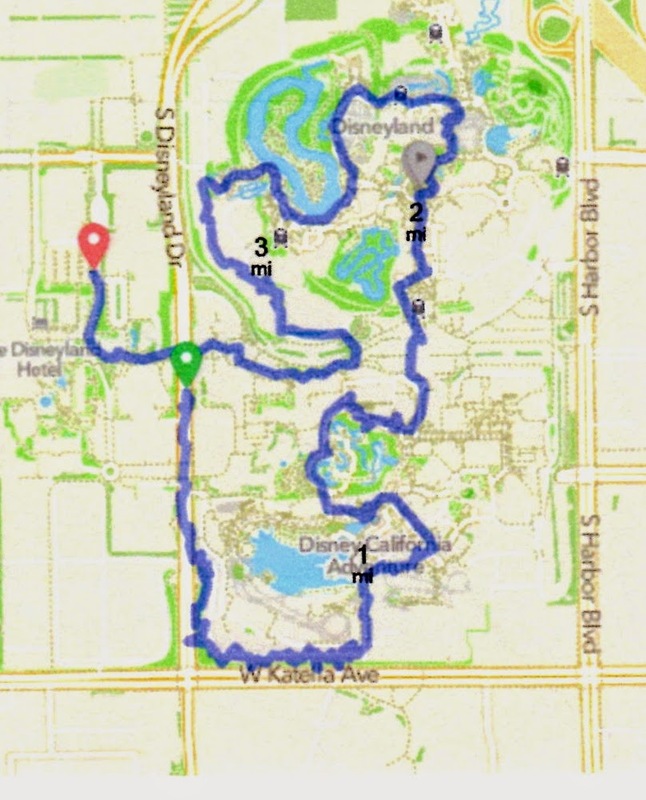 It was Friday, August 29, 2014, the morning of the Disneyland 5k and I awoke extra early. I was excited to run my first "solo (without my daughter pushing me)" race along with 5,999 other runners. My alarm was set for 3:30 am, but I was wide awake by 3:10 (still on East Coast time). Time passed quickly and you could feel the excitement in the air. Carissa and Rudy kept the crowd going, along with Lilo and Stitch. Then a surfer came out and led a "surfer themed" warmup. The next thing you knew, it was time to go with a burst of confetti! This was my first race at Disneyland. When we entered California Adventure just before mile 1, I found myself slowing down and "looking" It was the first time I saw Cars Land and because of my love of Disney, I was kind of distracted. Then, I remembered why I was there! My RunKeeper app was set to a walk/run pace and I surprised myself by maintaining this through almost the entire race. The miles went by quickly. I'm sure this was because most of the miles were in the park which was really fun. It was way more humid than I thought it was going to be so I took advantage of both water stops. 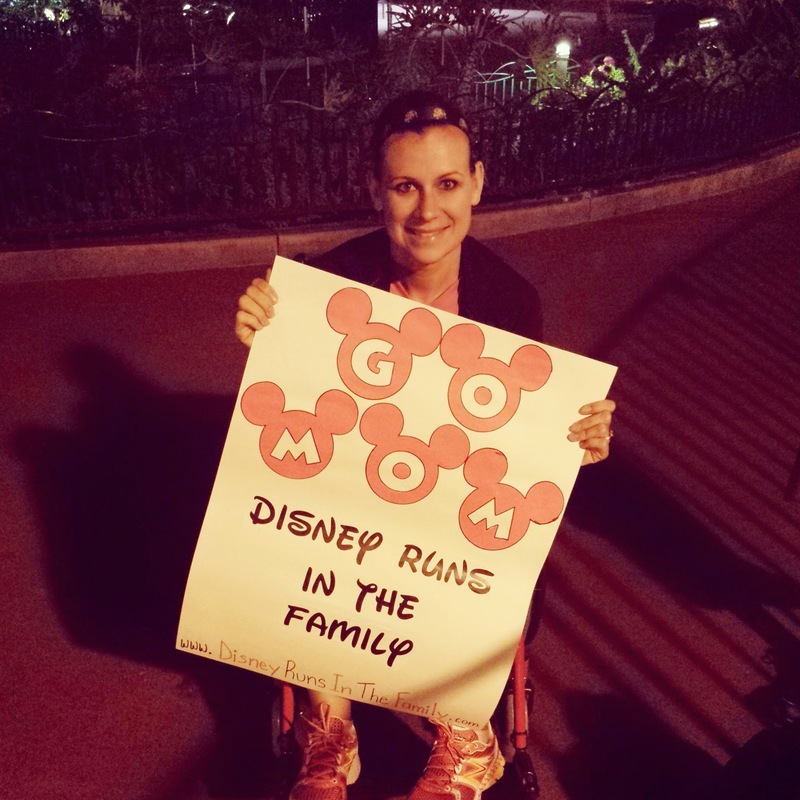 As I was passing under the monorail near the spot where my family was supposed to be, I spotted them holding up a sign and cheering me on. I think that gave me the final push I needed to finish strong. I received my medal from one of the many wonderful volunteers (Thank you, volunteers!) and went to the tents to meet my family. My regret: I didn't take any pictures on the course! I was so concerned about "getting it done", I never stopped. My accomplishment: I PR'd my 5K! After looking at my stats, I know I will do fine in my first 10K in May. Tinkerbell here I come!